The pilot episode of AMC's Preacher, from Seth Rogen, Evan Goldberg, and Breaking Bad's Sam Catlin, is an interesting specimen in that, in this day and age of comic book adaptations ruling the cinemas and beginning a slow, methodical takeover of the television landscape, it registers more as the pilot episode of a new television series than it does as yet another comic book adaptation. Conceivably beholden to the larger arc from the graphic novels by Garth Ennis and Steve Dillon on which it is based, the first hour is, for the most part, unconcerned with the scope of that arc, and instead has its eyes set on the basic elements of the story – its tone, its setting, its characters and the things that make them distinct. The pilot serves as an interpretation of what came before, adding to and taking away from the primary text, so that what is left will either stand or fall on its own merits, thereby demonstrating the source material is worthy of adaptation through proof of its pliability, as opposed to declaring the source material's virtue by a slavish devotion to its precise recreation. Although they are both serialized and have a tendency to hit the reset button after shaking up the status quo time and again, comic books and television series are two different mediums, each with their own specific needs, often fed by distinct beats and rhythms. For one or the other to attempt to reproduce those rhythms and present them on the page, or in this case, on the screen is tantamount to impersonation. Preacher, then, in its first hour, attempts to strike an appropriate balance between adaptation and interpretation, putting much more emphasis on ineffectual, violence-prone Texas preacher Jesse Custer (Dominic Cooper) than on the story's supernatural and fantastical religious elements, though they remain consistent and hinted at throughout. For those unfamiliar with Preacher, the comic that ran under the Vertigo imprint, the story follows the aforementioned Jesse Custer, his ex-girlfriend Tulip (Ruth Negga), and vampire buddy Cassidy (Joseph Gilgun) as they go on a literal quest to find God after Jesse becomes host to a powerful entity. There is much more to it than can be described in such hasty fashion, but as is made evident by the pilot, the series isn't necessarily in any sort of hurry to drop a ton of exposition on the audience. Instead, the plot involving the mysterious screeching entity that imbues Jesse with the ability to make people follow his commands to the letter, hangs for the most part in the periphery, explained only through a series of bloody encounters where various evangelists become inhabited by the entity, only to explode a short time later, unable to contain the awesome power within them, and covering their flock in gore. These brief encounters generate enough interest in the being that after the grisly detonations of a preacher in Africa, a Russian Satanist, and Tom Cruise, that by the time the entity finds its way to the uninspired pulpit of Jesse Custer the two disparate story threads begin to click together. The exploding men of the faith aren't just a way of introducing the entity called Genesis – though it is never given a title in the pilot – they become an effective way of demonstrating the exceptional nature of Jesse Custer. It is justification for why the story is about this embattled son of a preacher who has a history with the exciting, violent, and engaging Tulip and befriends Irish vampire Cassidy after a bar room brawl wherein his true, ferocious nature is revealed on a group of wife-beating good ol' boys. After all, if one of the most famous people on the face of the earth can't contain this otherworldly being, then Jesse must be something special after all. It becomes a great way to set the character up, helped out by Cooper's performance of a man taken to a lifestyle unsuited to his temperament, in a town full of people he'd just as well forget. The slow-motion shot of Cooper smiling as he beats a man to a pulp is the visual equivalent of pages worth of dialogue. At the same time, the pilot's exploration of Annville, TX and its denizens (both old and new) makes for a more convincing first installment than if it had been engrossed with explaining the origin and purpose of Genesis. Instead, the introduction of W. Earl Brown as Sheriff Root, along with Lucy Griffiths' Emily, and a terrific comedic performance from Brian Huskey as Ted, a man locked in a constant struggle for respect from his aging mother, gives the series a welcome lived-in quality. Annville and the rest of the series may exist in the extreme, but it succeeds in making everything feel a necessary part of that extreme. It is great that the series devotes so much time to developing its setting, but the pilot gets to be a little crowded after a while and maybe a few introductions could have been save for the second or third episode. Case in point: the introduction of the sheriff's son, Arseface (Ian Colletti), feels shoehorned in and intended only to further underline the peculiar, unsettling nature of Annville and its inhabitants. On the plus side, the same cannot be said for the other two primary players. The pilot didn't need to open up Tulip's story with a crazy knife fight in the backseat of a runaway car, followed by her befriending the neglected kids of a moonshiner before blowing a helicopter out of the sky with an improvised rocket, but it's hard not to be glad that it did. The same holds true for Cassidy's bloody introduction that sees him literally drop in on Annville after laying waste to a group of vampire hunters on a private jet. The pilot reveals just enough about the characters to make them interesting and to keep the audience invested in the "what and why" of their stories. Whereas some films and other inter-comic-universe television series set up their universes by taking advantage of a certain pre-fab quality, Preacher expresses far more interest in the basic materials from which it can build something a little different over time. The first episode doesn't care much about plot, in fact, for the most part, once the pilot gives way to the end credits, the plot of the series is still a mystery to those without a road map in the form of the comic books or a very deep dive into Wikipedia or some other database committed to rehashing the broad brush strokes of the comics. And because of all that – the excessive violence that plays into the inherent outlandishness of the story and the characters, the underlying zany, comedic tone (like the young woman's rock 'n' roll cover of a hymn), and the sense that the whole thing is one the verge of flying off the rails – the pilot episode ends feeling like one massive, exciting gamble. It is rare for a show to throw in completely with the risk of its weirdness, and to play up its mystery, to dole out the specific aesthetic vocabulary of the series piecemeal as it does. This approach is refreshing, but it requires a lot from those doing the actual watching. It's an intriguing trust fall on behalf of creators Rogen, Goldberg, and Catlin. The series demands patience of the same people who are being denied a guiding hand. 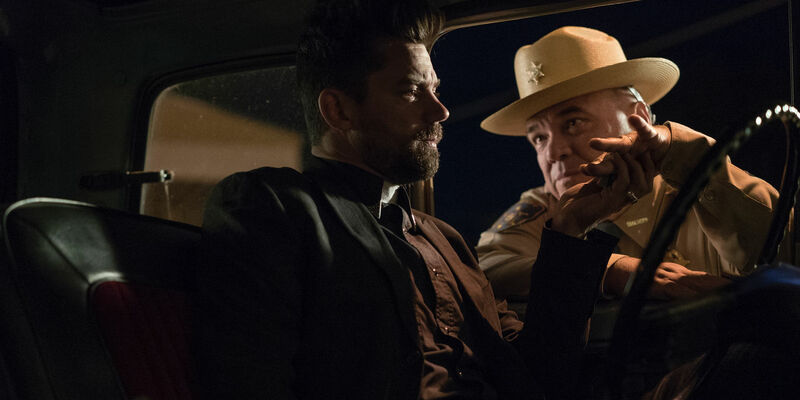 In the end, Preacher wants the viewer to figure out how to watch the series as it moves along, but given the spectacle of the pilot, it also wants them to have a lot of fun doing so. Preacher continues next Sunday with 'See' @10pm on AMC.